This book just burns through you like a cleansing fire, bright and intense like the flames that make up the djinn. It follows the story of a con-artist named Nahri who is in the possession of magical abilities she barely believes in. Saving herself from starving in the streets of Cairo is a much more pressing matter than the mystery of why she can speak any language she comes into contact with, or why her skin knits itself from wounds that would have killed anyone else. But as is the wont of books like these, when Nahri finds out she is the last of a blood-stained and fanatically pure-blooded line, she is thrown into a political firestorm that spans the elements and all of the djinn families. 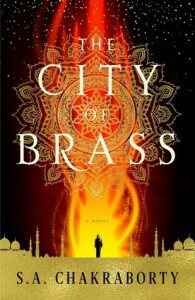 Trust me, this is a fantasy series that sears itself into the back of your eyelids with vivid imagery and impeccable world-building, and you'll see the city of brass in your sleep.